Full email headers - the headers you normally don't see - are well buried in Outlook. 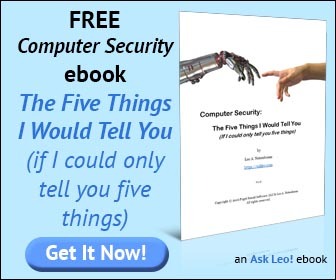 I'll show you how to view them in Outlook, Outlook Express and Thunderbird. Now headers on any given message may look a lot different. It may be longer or shorter, or have additional information, or less. But the basic idea is that there's a lot of information in the headers that has to do with the administration of getting the email from the sender to the receiver. Most email clients hide all that and show you only the stuff you care about: "To:", "From:", "Subject:", date and time, that kind of thing. It's rare that you actually need to see everything else. To actually view the mail headers of a message, the steps are naturally different for each mail client. 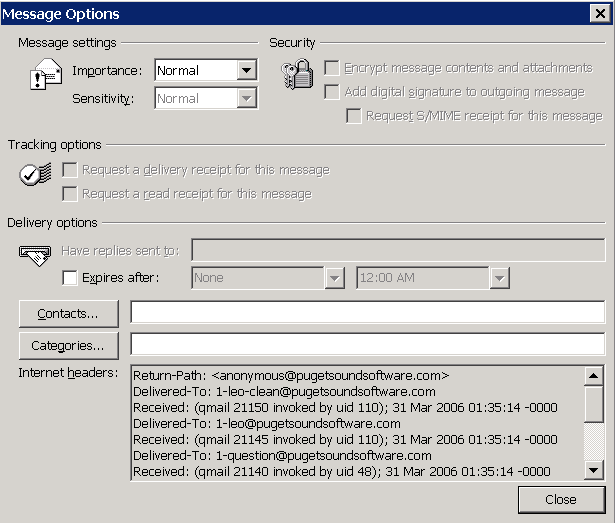 For Outlook 2010 (and possibly 2007) see: How do I view full headers in Outlook 2010? The section labeled "Internet headers:" contains the full internet headers for the message. Unfortunately it's almost always too small to show them completely. While you can scroll up and down within that box, I find it easier to copy them to notepad to view. Click in the headers, type Ctrl+A, followed by Ctrl+C to select all the headers and copy them to the clipboard, than then open notepad and click on the Edit menu, and then Paste. This time, however, the box with the internet headers cannot be so easily copy / pasted into another application. Instead, you can press the Message Source button and get the entire message, including its headers, in a resizable, scrollable window (that you can copy / paste from, if you like). 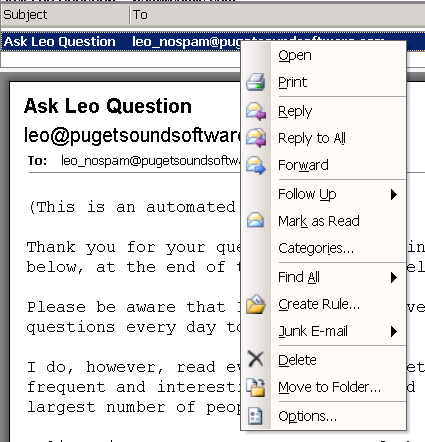 In Thunderbird 3, click on "other actions", and select the "view source" item to view the entire original source of the email message, including the message headers. Mail clients, including free email services, are all different. Some may display full headers by default, others will hide them, but provide some way, perhaps obscure, to view them. The good news is that it's rare you'd actually need to see them anyway. How do I view full headers in Outlook 2010? 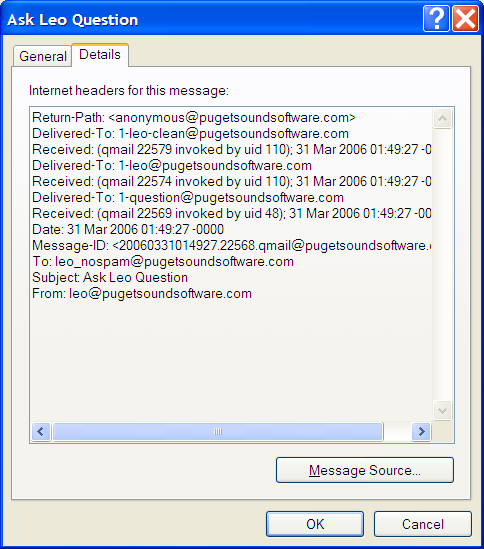 With Outlook 2007 and 2010's interface change the path to locate the full headers for an email message has changed. I'll show you how I found them. How do Outlook and Outlook Express relate? Even though they share similar names and do similar things, Outlook, Outlook Express, and Outlook.com are actually not related to each other at all. The information is somewhat correct, however when viewing the Internet headers in Outlook, this information is NOT the full Internet headers, needed to report spam. The example you show in Outlook is insufficient to report spam. Apparently it is impossible to get Microsoft to explain how to do this, unless you use a patch-in hack code for the Outlook registry. They obviously have not built that into the Outlook system, like they have for express. b) Can I get the full header to an email if that email was copied and pasted and sent to me as a new message. In other words, it wasn't sent to me as an attachement, nor was it forwarded. It was copied and pasted. I can see the person email address, date, etc...but is it possible to get the headers from that? the headers are obvious and displayed as part of the message that you recieve. If you don't see them, they're not there. i still do not know what is full header do i need it? Is there any option to view mail id in the BCC field from a received email? No. That would defeat the whole purpose of BCC. 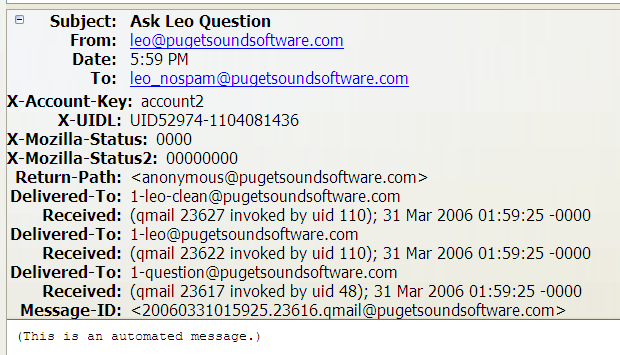 Answer above for Outlook address information is fine for all e-mails except those I send. How to I tell who I sent it to? I have "replied" to e-mails and in some cases it is NOT the address I received it from but a very similar name in my contact list. I can't tell where it went. Now what? Seems very dangerous to be unable to confirm where you actually sent something. In outlook 2003 some of the messages I am receiving show the full header in the message, which makes it very difficult to read. How do I hide them from the email message? I'm on Outlook 2010. The example you show for Outlook doesn't look like mine. There isn't an "option" when I right-click on an email. Is it possible to see headers using Outlook2010? I read your article on viewing header information in Outlook 2010 emails. But, how do I view the header information for a SENT email in this program? I need to see who was included in the BCC. This is a one time procedure. 1. Click on "New Email"
After that when you open a sent email (you won't see it in the preview window) the BCC field will appear in your email. I am currently researching how to post a spam e-mail t SpamCop. Windows 7, Outlook 2007, having difficulty getting SC to accept. I get an error regarding missing header info. Please advise. Thank you.